Nothing focuses the mind on transforming raw material into an object of beauty, utility, and practicality better than landscaping. The land will make you wait when you do not feel like waiting, and nature, a mysterious consequence of every landscaping design, will do everything you do not want it to do. Landscaping can do wonders for the surroundings. Many people find it very useful. In fact, in the survey conducted by the Gallup Organization, almost 54% of Americans have said that the top benefit of landscaping is the relaxation and enjoyment it brings for people to enjoy. In beautifying a big garden, employing the principle of landscaping is extremely important. Some people contend that improving the appearance of a big garden can be a daunting task. So what is a landscaper to do? It would be best to relax and respect the natural rhythms of the elemental materials found in the garden. A landscaper should learn the value of patience and flexibility. It is with these attributes that a true landscaper can work out the details of the job. The landscaper must take into consideration the size of the yard. If it is a big garden, it is best to use the proper number of plants and trees so that the area will not appear dull and empty. When landscaping a big garden, one should keep in mind that employing the principles of landscaping should not just focus on enhancing its features. The way the trees provide shade is a vital factor. A big garden usually contains some trees and shrubs even before the landscaping process begins. It is best for a landscaper to examine the area before he starts planning the design. The proper placing of the plants is a necessity. Since it will be a bigger area, it is best to consider the plants that need more sunlight and those that should not be directly exposed to the sun. In landscaping, what is important is to emphasize the beauty of the nature. This means that if there are natural rock formations in the area, it is best to put emphasis on them if the rocks seem to be worthy of attention. All of these things boil down to the fact that the size of the area should be the top consideration of the landscaper. The size of the garden will determine if it needs more trees, plants, or other embellishments. Size really does matter. If you live in the Chicago area and you are interested in getting some landscaping, Chicago native plants are your best choices. If you choose native plants you will find that your garden or yard will be much easier to take care of as time wears on. At first working in the yard may not seem like a big deal but you may get sick of it when the bloom wears off the rose, no pun intended. This is normal, we start to take our yards for granted and it is not so much fun to work on the landscaping Chicago anymore. You can even use these native plants to solve your drainage problems. Chicago, for instance has many problems when it comes to drainage. They get a lot of different weather there and it affects the gardens more than you might think. When you are landscaping, Chicago weather needs to be taken into consideration at all times. Talk to your landscaper about what plants will be best for your yard. Don’t skimp with your landscaping, Chicago residents will know you did it and that is never cool. Take your time and find the perfect plants to suit you and your goals. And mention to the landscaper if you notice that you have any drainage problems and perhaps he will be able to suggest some good landscaping Chicago native plants to use. Just make sure that you see a picture of any plant before you agree to use it. Who knows what you might get otherwise. Everyone’s tastes are different and yours may be the polar opposite from the landscapers. When trying to choose the right plants for landscaping Chicago take a look around you. 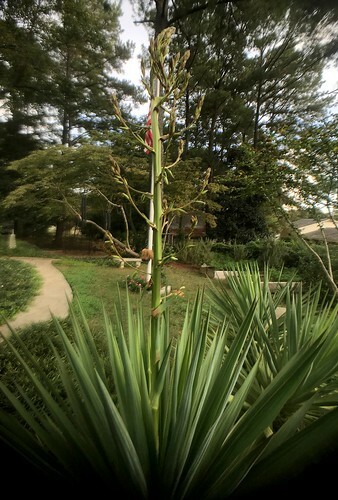 What kids of plants do your neighbors have? Which ones do you like and which do you despise? Show the landscaper that you choose what you are interested in seeing if your own landscaping. Chicago landscapers tend to be very flexible and open to ideas. This is your yard after all and you and your family are the ones who have to live with it forever. When looking into landscaping, Chicago perennials may be the way to go. This way you will not have to plant new flowers and plants each and every year. That is a lot of maintenance and most people with landscaping, Chicago residents anyway, do not have the time for this kind of thing. Concrete landscaping was unheard until recently as the word “concrete” seemed to visualize a dull and rugged garden. But right now, concrete is seen as one of those major elements in landscaping. It is used for patios, pathways and driveways. 1. Use concrete to design walkways and paths. The garden will look beautiful if concrete is added for the walkway or path. It does not matter if one has a large or small yard – concrete is pretty flexible when it comes to adapting to this use..
2. Concrete for garden add-ons! 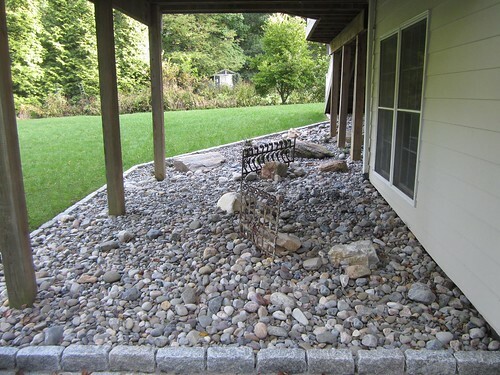 More reasons why concrete “rocks every landscape designer’s socks”: it can be made into a patio or a planter. 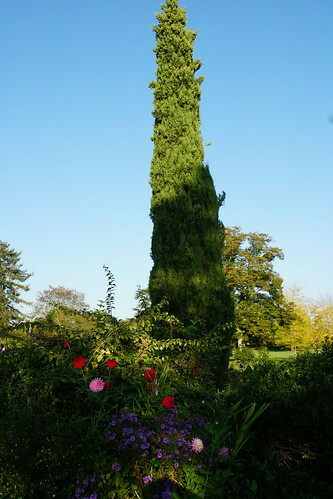 It can even be the material for the sundial in the garden! 3. Concrete is good for stone walls. One of the landscaping trends is the use of concrete in creating stone walls. Walls act as the house’s frame. They can keep the pets from wandering around and yes, keep the trespassers out! Walled houses can discourage burglars from breaking into the property. 4. Unruly soil? Go for concrete! One surefire way to keep the soil in place is through concrete landscaping. The ability of concrete blocks, which come in different styles and textures, adds flair to the garden. 5. Concrete can decorate too! Concrete is best suited in landscaping because it can be customized to fit the home owner’s needs. As it can be in the form of brick, slab or block, it can embellish the garden like never before! Concrete borders make sandbox-building possible – also easy. It can enclose the children’s playground and make the pool-viewing a more enriching experience. What else can be done with concrete in landscaping? The list is endless: concrete flatwork, concrete floor slabs, concrete foundations and concrete coloring and stamping. The concrete can act as the foundation for gutter splashes, basketball courts, tee boxes and tree rings! It is important research the companies which specifically cater to concrete landscaping. Bayshore Concrete and Landscaping, Terraforce and Endless Borders specialize in this type of work. Who would have thought that concrete finally found a place in the area of landscaping? Concrete has somehow changed and yes, revolutionized the look of the home garden. It is prettier and much, much better than ever before. Regardless of whether you are just venturing out into the business world or already have a successful company, budgeting your expenses will help to improve profits and the overall health of the business. The largest expenses that a landscaping business has are advertising and the cost of equipment. 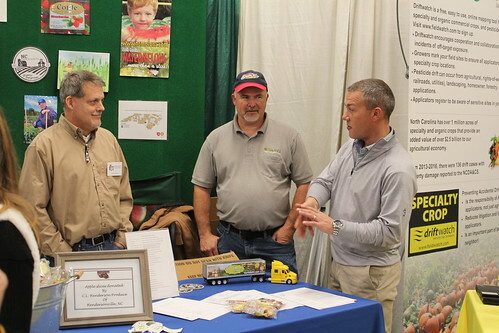 The prices associated with a print advertisement can be significant, which is why a growing number of business owners are turning toward an alternative way of spreading the word about their landscaping business. With a company that provides local services, such as landscaping, it is more important to reach a local audience as opposed to a national one. The most common way to generate free publicity for a landscaping business is through a press release, which is distributed to local newspapers, magazines and trade publications. Whether the landscaping business has an actual storefront present, is home or web-based, this option may have a positive success rate. In order for a press release to be worthy of publication, it must feature some type of news. A terrific example would be a grand opening, the launch of a new website, a free landscaping project contest or similar newsworthy event. A photograph of the business owner would make a nice accompaniment to any press release and may even grab the editor’s attention. Press releases can be submitted via mail, e-mail or fax and should be directed to the editor’s attention. Many businesses, including those that provide landscaping services, often choose to have a website. Although the internet does provide for national exposure, many local customers may surf the web for landscaping information. A website should be professionally designed, regularly updated and feature plenty of landscaping example photos to showcase your ability. With a website, the free promotional opportunities are unlimited. From press release submission websites to article marketing and search engines, there are plenty of ways to get the word out about your new web presence. Just as there are a number of ways to generate paid advertising, there are even more ways to obtain free publicity for your landscaping business. Most local companies will find paid advertising works most effectively in the telephone book’s yellow pages, but may also find limited success with newspaper and/or radio advertising. The main problem with the latter is that newspapers are often discarded quickly and most people do not have a pen handy when listening to the radio in order to write down a contact number. When you reduce the advertising costs and increase profits, your company’s bank account will begin to glimmer just as much as the dew on a beautifully landscaped lawn. Busy homeowners who care about the external appearance of their home as much as they do the interior can turn to a landscaping contractor for design ideas and to handle outdoor projects. A licensed landscape contractor has been specially trained to meet all landscaping needs – whether for service purposes or cosmetic. Everything from driveways, patios, and decks; to grading the yard, and complete landscape design. Garden ponds enhanced by a pond bridge, wooden “playscapes” for children, walkthrough gardens, and placement and selection of trees, shrubs, and other flora to balance the yard and enhance visual appeal. Like other qualified professionals, different landscape contractors will have specific areas of experience and expertise. For instance, hire an experienced landscape lighting contractor to install outdoor lighting features. They are knowledgeable about different types of landscape lighting, and when and how to use each for maximum benefit. Few homeowners are savvy as to the best way to enhance landscape features using contour lighting, uplighting, grazing, moonlighting, or backlighting techniques. A licensed landscape contractor, however, knows how to exploit the benefits of these type lighting features. If spare time is a problem, hire a landscaping contractor with experience designing easy-care landscapes, greatly reducing upkeep efforts. Mower-friendly lawns devoid of grass peninsulas and islands that slow down mowing, and require lots of turning and maneuvering. Opt for a low water landscape design using drought-tolerant plants and ground cover to conserve water and decrease maintenance needs. 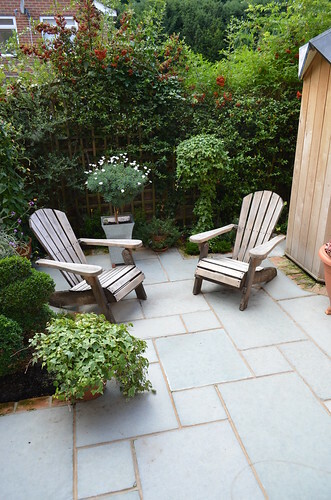 Small yards can be made to look larger using the expertise of a landscape contractor designer familiar with the “forcing the perspective” technique. Angling plants toward each other, extending to the rear of the landscape. Making the yard look longer and more spacious, while adding visual interest and enhanced beauty. A qualified contractor with a landscaping contractor license can increase the external beauty of a home, correct landscape problems, and bring balance to the yard – increasing real estate market value of the home. Select the right contractor for the right job. Some are more experienced with correcting landscape flaws and the use of flora enhancements to beautify and balance to the yard. 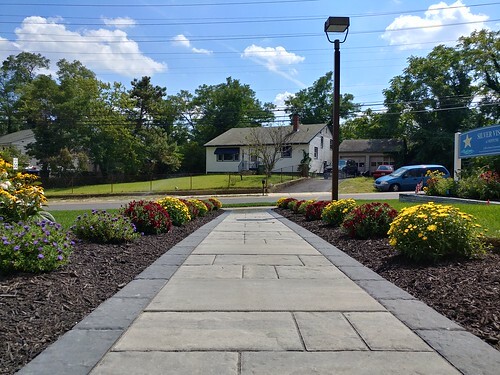 The expertise of another landscaping contractor might be concrete driveways, walkways, and custom edging the landscape perimeter. A construction contractor landscaping expert might be best for building a raised deck, split-level patio, or a number of other functional outdoor projects. 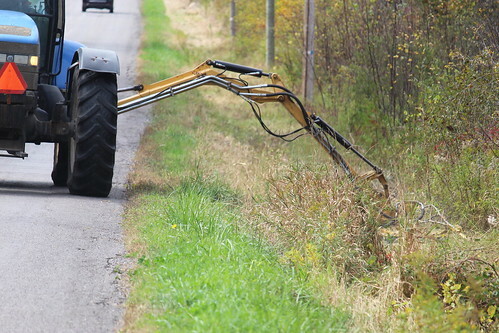 Word of mount referrals, local licensing authorities, and Internet resources such as www.handycanadian.com are your best resources for finding a qualified landscaping contractor in your area. Carefully selecting a qualified landscaping contractor ensures outdoor feature success, adding to the appearance and value of your home. In this day of the information age it has never been easier to find out what you need to know in order to hire the right landscaping company for the job. No matter if your job is a small one of a large one you still need to make sure that the landscaping company that you choose is reliable and trustworthy and that they actually know what they are doing. You should start by finding out how long this landscaping company has been in business, the longer the better. If they have been in business for 20 some odd years then there is a much better chance that they are good at what they do. Of course there are exceptions to this rule but it is a pretty good rule of thumb. If they were so bad they would probably not have been able to stay working for so many years. Your checking up should not end there however. You still need to find out just how well run a landscaping company they are. Look at it this way: most landscaping companies are small business and they only have a few people working there. The owners have to do the bulk of the work on their own. That is why they are not always as reliable as they should be. Like other contractors they have a lot on their plate and they can at times get overwhelmed and not show up for a job when they were supposed to. While I do not excuse it I can understand it. They have a lot of people demanding certain things from them. The owners of the landscaping company will generally have to do all of the free estimates themselves, take the appointments, get to the appointments, do the books and then do the actual landscaping company work. Wow, that is enough tot run anyone into the ground. That is why you should find out how many clients a potential landscaping company has at the time you ate going to hire them. If they sound as if they will be too busy then you might want to choose another landscaping company, one that will have the time that you need. You need to choose a landscaping company that will be dedicated to the work that you are getting done, you are paying for a service and you deserve for it to be as good as it can be. There is many a landscaping tip out there to satisfy even the most desperate of landscapers or would be landscapers and you can find hundreds of them online. But in all of my years as a landscape artist I have come to the conclusion that while there are many different landscaping tips only a few are universal and there is a good chance that only one landscaping tip will do you any good. The landscaping tip that you need the most will be different than the one I needed because each project is different, so take your time and learn about as many landscaping tips as you can before you start your project. For the person who wants to give their garden a face lift they have some options available to them. These options will range from simply adding new plants and other garden accessories to your garden to hiring landscaping firms. You could look at some landscaping ideas before you begin any major sweeping changes to your garden however. By looking at these landscaping ideas first you have the ability at hand of seeing what items you might like to have in your garden. These ideas will also let you see how you can reasonably change your garden – no matter how big or small – into one which reflects your personality. One of the best ways to finding good landscaping ideas is to look at magazines which deal with this area of gardening. You can also get lots of ideas for a great looking garden from exhibitions which are sponsored by landscaping firms. As these places are always on the lookout for new clients they will have the most current ideas and trends featured in their exhibitions. There may be instances where you will have the opportunity of buying items which can help you develop an idea around which your landscaping ideas can develop. As the key to a great looking garden depends on how all of the items in the garden meld together you will need to think about where all of the items should be placed before you start transforming your garden. This is vital for your landscaping ideas to come out in the way that you want. You can solidify the look of the garden by sectioning your garden out. This sectioning out can be done on a piece of paper or you could use one of the many landscaping software programs. These programs will allow you to see how various ideas can be incorporated together. As the program will give you a rough working idea it is even better if you look at each part of the garden and see how you can change the garden’s look. Now if you feel like it you have the chance and ability of making sure that every bit of the garden shows some interesting item, feature or plant in the various seasons. This seasonal garden look is just one of the many landscaping ideas that you can try out. There are many different landscaping ideas that you can try out. While many of these ideas may require you to spend loads of money there are others that you can try. These different landscaping ideas whether they are simple or complex ideas all have the same end goal in sight, and that is to make your garden look unique. Landscaping is nature’s greatest form of art. It is one form of enhancing the natural splendor of a particular piece of land. It combines the different facets of creativity into one giant creation of art, beauty, utility, and practicality. Shade trees provide protection against the glaring heat of the sun, where trees can actually soak up almost 85% of the sun’s ultraviolet rays. Some people do not know that landscaping can also be a good source of food. Most garden-lovers think that beauty in nature lies in the flowers and ornamental plants. What they fail to notice is that vegetables can make a nice display in the scenery as well. Vegetable gardeners contend that the bright yellow color of the sunflower under the heat of the sun is as magnificent as the rich green color of lettuce. The best thing about it is that these vegetables do not just feed one’s eyes but their stomach as well. Most people who realize the value of vegetables in landscaping instantly decide to start planting edible plants in their garden. They find that landscaping using vegetables is a gratifying activity, more than merely landscaping with flowers and shrubs. The common benefit that these people assert is the fact that landscaping a vegetable garden does not just add beauty to the area but can also provide the health-supplying goodness of vegetables. When landscaping a vegetable garden utilize a detailed principle – because the main purpose is to grow vegetables that produce continuous harvests. 1. Try to separate ornamental plants from the vegetables. This is to avoid the contamination of the different pesticides for each type of plant. 2. Crop rotation is extremely important. Keep in mind that landscaping vegetables should not focus more on the beautification than how the land will respond to the demands of the plants. 3. Proper maintenance is important. Rotting fruits are not a good sight nor a positive feature in a landscape. 4. Use vegetables that can easily be maintained and that are very attractive. Landscaping a vegetable garden is the most profitable aspect of the process. It makes one’s yard productive and fascinating all at the same time. Having a low maintenance front yard is the goal of many people. You can get easy to manage front yard landscaping done by any of the professional landscapers in your area or you can do it yourself. Either way you can have front yard landscaping done that will take minimal work to keep looking fantastic all year round. 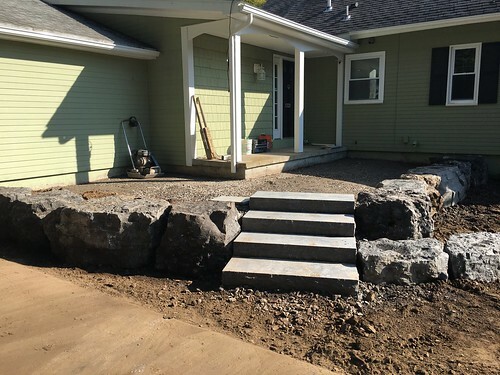 If you are going to get a professional in to do your front yard landscaping though, be sure to tell him that this is your over all goal, that you want to have a yard that will not take a lot of work to keep up. If you have less grass in your front yard landscaping then you will cut out a lot of maintenance time right there. Mowing the lawn can take up a lot of time and energy so keeping the grass to a minimum is a great way to save on work. Talk to the front yard landscaping expert about alternative that you can use to keep your yard look good with little lawn area. Some people choose to use clover instead of grass. Using a clover lawn in your front yard landscaping is a good idea because it will save you money and time. You will not have to mow it very often at all and a clover lawn is even good for front yard landscaping in area that is prone to droughts. They do well virtually everywhere. And best of all for those who want to get out there and enjoy their front yard landscaping, bugs hate clover. Watering the yard can be a big hassle as well. That is why many people incorporate automatic irrigation systems into their front yard landscaping designs these days. This can save you tons of time and money. This is one of the easiest ways for you to keep your yard looking healthy and well watered during the hotter months of the year. No more hooking up the sprinkler or having to drag out the hose. You can get a professional to install one of these systems for your front yard landscaping design quickly and easily or you can get a kit and do it yourself. I would recommend getting in a professional however, unless you have experience with this kind of thing. If you were to cause a leak then you could face some flooding and rotting and neither of these is going to do anything for your front yard landscaping, do you know what I mean?